Guitar TAB. Guitar Mixed Folio; Guitar TAB. Rock. Book. 144 pages. Alfred Music #00-40533. Published by Alfred Music (AP.40533). 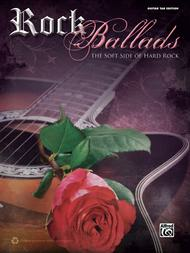 This book contains 26 of the greatest rock ballads ever committed to record, in notation and guitar TAB. 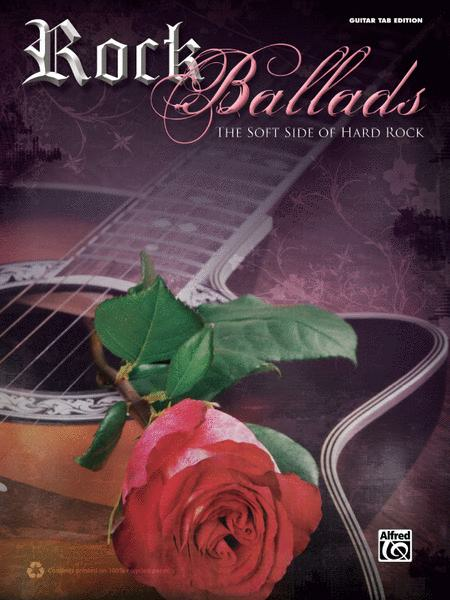 Included are hits by Aerosmith, Bob Dylan, Journey, The Rolling Stones, Guns N' Roses, and more. Titles: Breathe (Pink Floyd) * Broken (Seether feat. Amy Lee) * Europa (Earth's Cry Heaven's Smile) (Santana) * Faithfully (Journey) * Fountain of Sorrow (Jackson Browne) * The Game of Love (Santana feat. Michelle Branch) * Handy Man (James Taylor) * Higher (Creed) * I Don't Want to Miss a Thing (Aerosmith) * If You Leave Me Now (Chicago) * Kiss from a Rose (Seal) * Knockin' on Heaven's Door (Bob Dylan) * The Load-Out (Jackson Browne) * Marry Me (Train) * My Immortal (Evanescence) * Nights in White Satin (The Moody Blues) * One Thing (Finger Eleven) * Only the Lonely (The Motels) * Open Arms (Journey) * Patience (Guns N' Roses) * Stairway to Heaven (Led Zeppelin) * Thank You (Led Zeppelin) * When I See You Smile (Bad English) * A Whiter Shade of Pale (Procol Harum) * Wild Horses (The Rolling Stones) * With Arms Wide Open (Creed).